If you are a graduate fresh from university or looking for a career change and are interested in making a difference to the futures of young people across South Manchester and Cheshire then look no further. The Altius Alliance SCITT offers a gateway to a rewarding profession with its Primary and Secondary teacher training courses. Ofsted judged us Outstanding in all areas in November 2017 and our vision for the Altius Alliance is to continue to be a centre of excellence for producing outstanding teachers. The Alliance is led by Cheadle Hulme High School which holds an excellent reputation both locally and nationally for its students’ outcomes. All secondary course participants get the opportunity to train at Cheadle Hulme High School working alongside the expert practitioners that have been instrumental in building its success. Both the primary and secondary courses lead to achieving Qualified Teacher Status (QTS) and a PGCE (SCITT) with 60 Masters Credits. The primary course participants get the opportunity to train within our primary partner schools located in South Manchester and Cheshire. The SCITT programme dedicates four days of the week to the development of outstanding classroom practice. You are placed with an experienced Subject Mentor. You will shadow experienced teachers so that you have a deeper understanding of the wider role of the teacher – form time, duties, meetings. You initially work with the classes that your Subject Mentor teaches and you and your Subject Mentor plan collaboratively with a gradual reversal of roles occuring. Initially you will be taught how to effectively observe best practice. Collaborative observations will occur which will generate quality discussions about what is effective teaching and learning. You will be placed in a different school for term two where you will be able to continue planning and teaching but in a different environment. This placement will be personalised according to any future career plans you may have regarding the context you hope to work in. Continuing professional development still takes place but the main focus of this phase is to put learning into practice. During this time, you will spend a number of days in a sixth form setting to observe strategies used at KS5 if you have not been placed in an 11-18 context. The final phase of the course usually takes place back at the ‘home’ school where you will consolidate your learning. A menu of activities will be available such as visits to special schools/Pupil Referral Units/EAL schools; the opportunity to plan a school trip; working with specific groups of students such as the more or less able, and to ideally commence induction at your place or work, if already appointed by this stage. We believe in a holistic approach to teaching and you will access a SEND and Mental Health Course which is delivered by expert practitioners. The ongoing tasks and assignments lead to a Post Graduate Certificate. 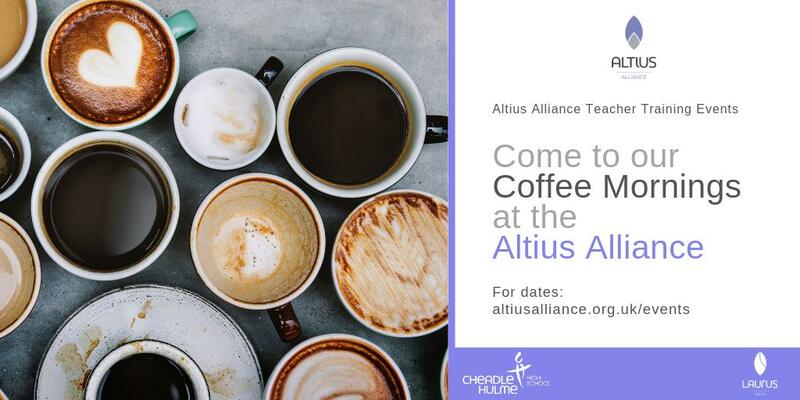 Since the Altius Alliance opened its School Centred Initial Teacher Training in 2015, 100% of those who trained with us have secured employment in education.